Archdeacon of Ecija in the fourteenth century, and one of the most inveterate enemies of the Jewish people; lived at Seville, where among Christians he was highly respected for his piety and philanthropy. In his sermons and public discourses he continually fanned the hatred of the Christian population against the Jews, to whom he ascribed all sorts of vices. As vicar-general of Archbishop Barroso of Seville he arrogated to himself the right of jurisdiction over the Jews in his diocese, injuring them wherever he could, and demanding that the magistrates of Alcalá de Guadeyra, Ecija, and other places no longer suffer the Jews among them. The Jewish community of Seville, at that time the richest and most important community of the country, was forced to appeal to King Henry II., who commanded the archdeacon, in a letter dated Aug. 25, 1378, not to meddle in future with the affairs of his subjects the Jews; not to incite the people against them; and to abstain from deciding their lawsuits. The Jews were empowered to withdraw from the archdeacon's jurisdiction, and the royal officials of Seville and other cities were summoned to protect the Jews in their rights. But this made no impression on Ferrand Martinez; and the Jews were obliged, four years later, to complain to King John I. John severely reproved him (March 3, 1382), but to no effect. The king issued a new edict (Aug. 25, 1383) in which he commanded the archdeacon to desist, on pain of heavy punishment. Nothing, however, could keep Ferrand Martinez from pursuing his purpose of exterminating the Jews. The community of Seville finally decided to summon the archdeacon before the highest tribunal. On Feb. 11, 1388, Ferrand Martinez, and the clothier Judah Aben Abraham, the representative of the community of Seville, together with their witnesses, appeared before the "alcaldes mayores" Ferrand Gonzalez and Ruy Perez. Judah, referring to the two royal edicts, demanded in the name of the community that the archdeacon should desist once for all from any arbitrary and unlawful acts against the community; otherwise the community would immediately bring a complaint before the king. 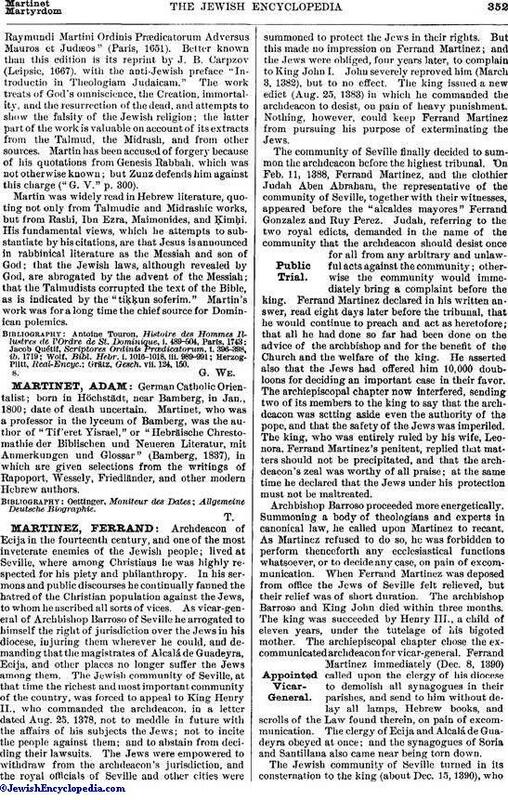 Ferrand Martinez declared in his written answer, read eight days later before the tribunal, that he would continue to preach and act as heretofore; that all he had done so far had been done on the advice of the archbishop and for the benefit of the Church and the welfare of the king. He asserted also that the Jews had offered him 10,000 doubloons for deciding an important case in their favor. The archiepiscopal chapter now interfered, sending two of its members to the king to say that the archdeacon was setting aside even the authority of the pope, and that the safety of the Jews was imperiled. The king, who was entirely ruled by his wife, Leonora, Ferrand Martinez's penitent, replied that matters should not be precipitated, and that the archdeacon's zeal was worthy of all praise; at the same time he declared that the Jews under his protection must not be maltreated. Archbishop Barroso proceeded more energetically. Summoning a body of theologians and experts in canonical law, he called upon Martinez to recant. As Martinez refused to do so, he was forbidden to perform thenceforth any ecclesiastical functions whatsoever, or to decide any case, on pain of excommunication. When Ferrand Martinez was deposed from office the Jews of Seville felt relieved, but their relief was of short duration. The archbishop Barroso and King John died within three months. The king was succeeded by Henry III., a child of eleven years, under the tutelage of his bigoted mother. The archiepiscopal chapter chose the ex-communicated archdeacon for vicar-general. Ferrand Martinez immediately (Dec. 8, 1390) called upon the clergy of his diocese to demolish all synagogues in their parishes, and send to him without delay all lamps, Hebrew books, and scrolls of the Law found therein, on pain of excommunication. The clergy of Ecija and Alcalá de Guadeyra obeyed at once; and the synagogues of Soria and Santillana also came near being torn down. The Jewish community of Seville turned in its consternation to the king (about Dec. 15, 1390), whoseven days later sent a letter to the archiepiscopal chapter, holding it responsible for all damages done to the Jews, and commanding it to rebuild or to repair at its own expense all synagogues that had been torn down or damaged. He gave strict orders that the archdeacon should be at once deposed from office and placed where he could do no further harm. The chapter proceeded to obey the king's command; but Martinez declared that an ecclesiastic was subject to the Church and not to the king, and that the chapter had no right to depose him from office, or to demand that he rebuild the demolished synagogues. Under Leonora's regency Martinez could defy even the king, receiving effective support from the people he had aroused. 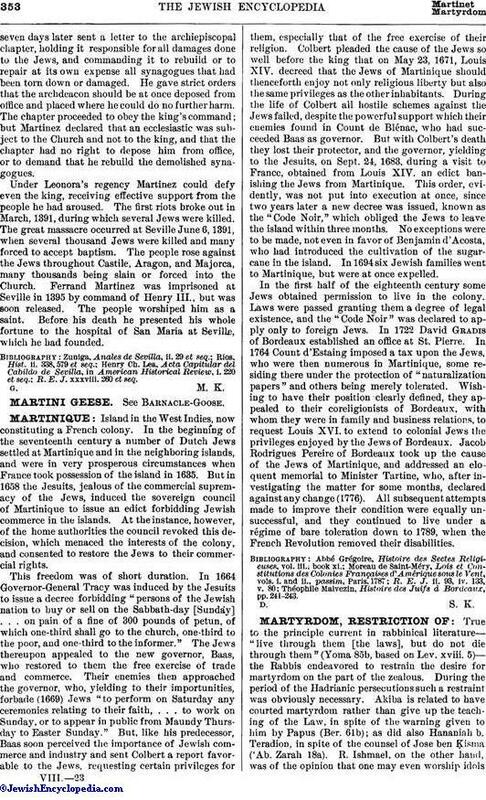 The first riots broke out in March, 1391, during which several Jews were killed. The great massacre occurred at Seville June 6, 1391, when several thousand Jews were killed and many forced to accept baptism. The people rose against the Jews throughout Castile, Aragon, and Majorca, many thousands being slain or forced into the Church. Ferrand Martinez was imprisoned at Seville in 1395 by command of Henry III., but was soon released. The people worshiped him as a saint. Before his death he presented his whole fortune to the hospital of San Maria at Seville, which he had founded. R. E. J. xxxviii. 260 et seq.